A police car speeds by with its siren wailing, and we can't help but wonder: what kind of criminal is it dashing off in pursuit of? We are intrigued by crime and fascinated with the work of the police as they track down the transgressors. 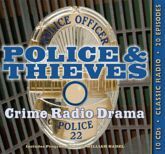 This anthology of post-World War II crime radio drama presents fictionalized crime, dramatizations of actual crimes, and programs that presented on-the-spot recordings of real police investigations. Radio Spirits is proud to present twenty adventures from fifteen of the best (and most unusual) programs broadcast in the last dozen or so years of commercial network dramatic radio. Series include Gang Busters, The Line Up, Broadway's My Beat, Man From Homicide, Night Watch, and more! Includes performances by Raymond Burr, Bela Lugosi, Mike Wallace, Dan Duryea, William Conrad, Raymond Edward Johnson, Louis Nye, Larry Thor, and more! Includes a Program Guide by radio historian and voice recognition expert William Nadel.